We offer a number of beautiful settings for your vow ceremony and venues for your reception. 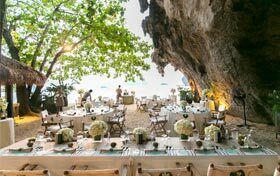 Wedding ceremonies and/or dinner receptions are held here in this striking ancient limestone cave overlooking Phranang Beach. Suitable for up to 30 persons, The Grotto is an outdoor venue with a sand floor. Perfect for small intimate group weddings. 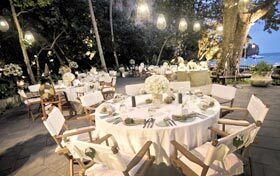 A venue for reception dinners, situated next to the Grotto, The Umbrella Tree Court is an outdoor deck situated under a number of large shady trees. It is perfect for buffet dinners for between 15 and 50 persons. 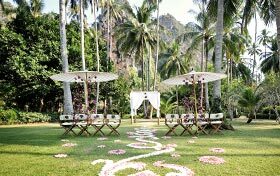 Suitable for ceremonies, this venue offers an open lawn surrounded by coconut palm trees. The Nammao Law is located near the hotel’s reception area. This venue is suitable for groups of between 20 and 50 persons. Enjoy a cocktail reception on the lower deck of Rayavadee’s traditional Thai restaurant which offers wonderful views over Phranang Beach before continuing upstairs for an intimate dinner in one of the restaurants private dining rooms. Perfect for small groups of up to 25 persons. Another stunning outdoor setting for your reception dinner. Here tables are arranged around the edge of the resort’s free-form swimming pool. 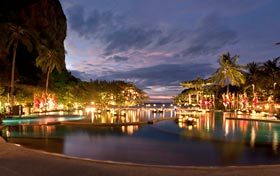 Guests can enjoy views over Railay Beach with its expansive limestone cliffs in the distance. Suitable for groups of 20-50 persons.